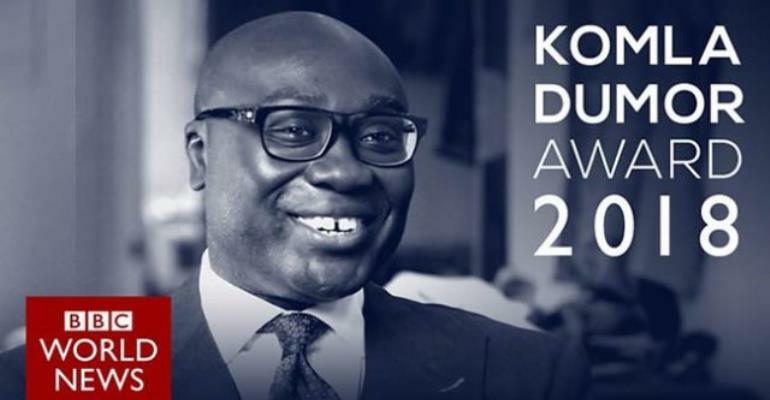 The BBC is seeking a rising star of African journalism for the BBC World News Komla Dumor Award, now in its fourth year. Applications close on 23 March 2018 at 23:59 GMT. This year's award is being launched from the Ghanaian capital Accra. Previous winners of the award are Nancy Kacungira from Uganda, Didi Akinyelure from Nigeria and Amina Yuguda, also from Nigeria. For her main project, Amina reported from Uganda on the threat facing Lake Victoria , Africa's largest freshwater lake, which scientists warn could be dying. "Being the winner of the 2017 BBC World News Komla Dumor Award felt like the beginning of my career. Getting an international platform, to be recognised at an international level, it's like I arrived," Amina said. "During my placement, I learned the importance of truth, balance and fairness, and gained invaluable insights into how to give African stories a global appeal. "We are proud of how Komla represented the continent to the world, and I feel honoured to be helping continue that legacy." Amina will take part in the 2018 launch event, alongside Jamie Angus, director of the BBC World Service Group. "It's an honour to be here in Ghana, in Komla's homeland, amongst his family and his friends, to celebrate his legacy and find Africa's next rising star in journalism. "The three previous winners - Nancy, Didi and Amina - have all shown they're talented journalists, with a deep-rooted understanding of the continent, and insights in how to improve engagement with local audiences. "We're looking forward to finding another exceptional journalist from the continent and welcoming them as the next BBC World News Komla Dumor Award winner."